By now most Consumerist readers are familiar with the Grocery Shrink Ray, where the amount of a product in a package shrinks over time to keep the price of the product consistent without decreasing profits. Sure, that’s annoying and perhaps a bit misleading, but the Shrink Ray’s sneakier twin — slack-fill — is even worse, and now it’s the reason for a class-action seeking lawsuit against Nestlé, accusing the candy company of “recklessly” underfilling its Raisinets boxes. 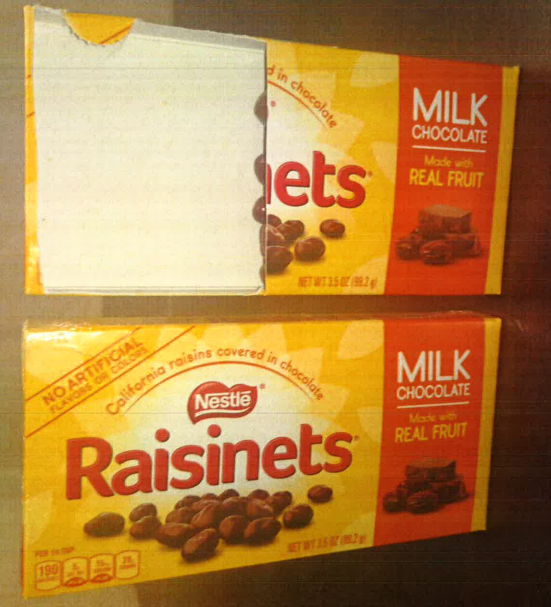 The lawsuit [PDF], filed in a California federal court, claims that Nestlé purposefully deceives customers with its opaque movie-theater-style containers of Raisinets, leading customers to believe they are getting more product than they really are. According to the lawsuit, the boxes — sold at grocery and convenience stores across the state — are uniformly underfilled, with only 60% of the package actually filled with Raisinets candy. The remaining 40% is considered slack-fill — empty space that, as defined by federal law, serves no functional purpose, such as protecting the package’s contents. By packaging the Raisinets in the way it does, the suit claims that Nestlé “recklessly disregarded the fact that the products contained a significant amount of non-functional slack-fill” that would mislead consumers. The woman who filed the lawsuit says she purchased the product at a Ralphs grocery store in California relying on the size and shape of the packaging, believing it was full of candy. The suit seeks to represent “at least thousands of class members” and to recoup at least $5 million in refunds and any interest accrued from their previous purchases. This isn’t the first time companies have come under fire for non-functional slack-fill. In July 2015, Proctor & Gamble agreed to pay $280,000 and revamp its packaging in order to settle with four California counties that accused the company of using slack-fill in its Olay brand beauty products. That three-year long investigation began when investigators in four counties discovered that for some moisturizers, the size of a product’s box depended not on the actual size of the container, but on the price per ounce. Of course, slack fill isn’t confined to beauty products: a smaller spice-maker sued McCormick in 2015 over containers of pepper that contain less product but have stayed the same size.